The NBA playoffs are the hottest tickets in town in Chicago, but there were two noticeable empty seats last night at the United Center for Game 1 of the Orlando Magic- Chicago Bulls second round matchup. Just before the end of the regular season, the Bulls and Magic faced eachother. After the game, Orlando’s Jameer Nelson was caught on camera telling Bulls’ Derrick Rose, “I’ll catch you in the second round.” But Nelson ran into one small road block, the Atlanta Hawks bounced the Magic in the first round. While the tickets were not claimed, in Nelson’s defense they were in the 300 section! Wrigley, the Chicago based candy company, gave Chicago Bulls star Derrick Rose a pretty sweet gift. Rose is a Skittles junkie and was given a customized Skittles machine. Wrigley has promised to keep it fully stocked for the next three-years. 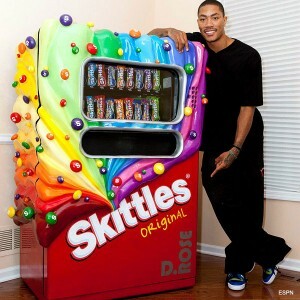 When Rose walks passed the Skittles machine, a recording of Rose’s voice plays tempting him to have a pack. I bet Lamar Odom is angry he doesn’t have one!